Test the Megler UHF link. Add water to the batteries. Put asset tags on some of the equipment. Download solar charge controller data. Tim, KE7TAC, and Dale, K7FW, made the trip up in the morning enjoying a beautiful fall day. When we rounded the final corner and the repeater building came into view we found that two of our solar panels were down against the building! Upon inspection we found that the deck screws used to hold the mounting frame together had rusted enough that the threads were mostly gone turning the screws into something resembling tapered rods. I suspect that during the last wind storm the stress was enough to pull the frame apart. Fortunately the panels did not break. I do not believe the electrical connections on the back of the panel have been damaged however we were not able to perform a close inspection. A week or two prior to our trip Jim, KF7NE, had enabled the UHF link radio at the Megler site. Our testing indicated that from the Arch Cape site a hand held radio would bring up the UHF link as well as activity the 145.45 repeater. The audio quality is poor with a great deal of static on the signal. Connecting a UHF hand held to the 7 element UHF beam will provide a good signal into the Megler UHF link as well receive the link output perfectly. Testing demonstrated that a UHF signal from the Arch Cape site using the beam antenna driven by a hand held radio will activate the Megler VHF repeater and provide good copy. With a good signal into the Megler VHF repeater the link signal received by the Arch Cape UHF beam is perfect copy. So at this point the UHF link can be said to work and the Arch Cape UHF antenna seems to be working quite well. A hand held radio power level is all that is needed for the UHF link. It had been quite some time since the last visit and the batteries were in need of water. We added about one and a half gallons of distilled water to the four batteries. On the next trip up I need to bring more water. I placed asset tags on the solar charge controller, TNC, radio used for TNC, and VHF cavities. I needed a square drive screwdriver in order to open the repeater cabinet so was not able to place tags on the CAT-300 repeater controller. The USB to serial converter that I took with us did not work with Tim's laptop. I need to search for another cable. So we did not retrieve the charging data. 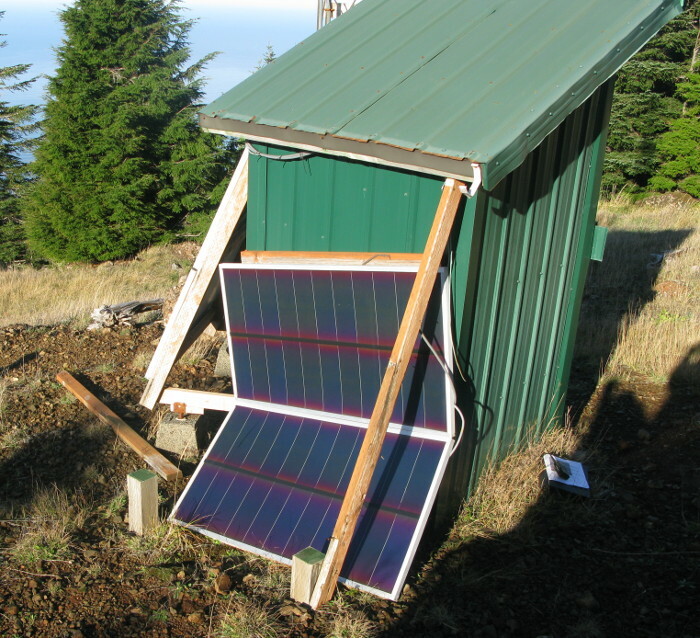 The next trip up will be one in which we rebuild the frame for our solar panels and get those back as they should be.